Message: The rhetoric of the day from fundamentalist Christianity, the American religious right, and others is that the god of the Bible, whom they serve, hates homosexuality. Some say that he even hates homosexuals themselves. They have good reason to. It says so in the Bible. So, the logical conclusion for a Christian is to say that god hates homosexuals, wants them dead, and even better, the issue is reiterated in the New Testament, validating the issue. I would argue that you are wrong - dead wrong. First of all, as society progresses, our understanding of humanity changes. We no longer look at an alcoholic as someone who should be cast out of society. We help them. But let us look at an argument that was a big deal back in the early 19th century. At that time in history, many nations, including the whole continent of Europe had abolished the terrible practice of slavery. If they hadn't abolished it, they had scaled back the practice. In Britain, the home country was slave free whereas the empire still allowed it. Much was said in the halls of parliament about abolishing slavery throughout the empire. It would take many years for this to actually happen, but happen it did. In America, by the 1830's, many politicians and upstanding citizens had spoken out against slavery and had branded it a "peculiar practice". This incensed many slave owners and their apologists came out of the woodwork, claiming that slavery was ordained by god himself. Not only was it ordained by god, but it was good and right. They had much in the way of proof from the pages of Scripture. Many passages in Genesis speak of the ownership of slaves as a foregone conclusion. God even blessed the actions of those slaves that did exactly what their master told them to do - as in the story of Abraham and his servant who went after Rebekah. Isaac was given many slaves, male and female, so that god could make him the envy of his enemies. In Leviticus 25, the same God who demanded that homosexuals be killed (the same homosexuals who Paul said could not get into heaven), made it a rule that the Israelites could buy slaves from the surrounding nations. Israelites could not be slaves. After the slaves were purchased, God called them property and even sanctioned the bequeathing of said slaves to the sons of the slave owner. This practice would continue forever, or at least until the slaves died. At the very end of his rules, god says that the Israelites could not own Israelites. He ends this rule by saying, "but you can't rule over your own kin ruthlessly." It would seem that this was a sanction to rule over those who were NOT their kin, ruthlessly. Solomon made all non-Israelite men, slaves, to do hard labor for his great kingdom while making all Israelite men higher class soldiers. In fact, the Bible, the inspired word of God, says that they are slaves to this day. We can look at it in another way too. Throughout the Old Testament, hundreds of times, God refers to people who do his bidding as "my servants." Even the human/God relationship is master/slave. 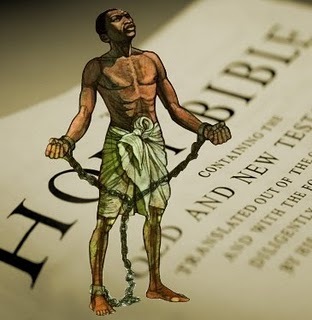 Books of the New Testament also refer to slaves as if it is normal. 1 Corinthians 12:13, Galatians 3:28. Pay special attention to Ephesian 6:5-9. Paul gives very special instructions to slaves and masters and how they are to treat one another. There is much more in the Bible about slavery than there is about homosexuality. In fact, most of the verses that are referenced in the New Testament that people claim have something to do with homosexuality simply don't. They are hyper-interpreted to inject this "sin" into the text when many other things could be read into it. These slavery passages propped up the arguments of the apologists for slavery in those times, but ultimately, they lost. They lost to the common understanding of the worth of human life in those days. Prominent abolitionists also made arguments from the same holy text, claiming that, though slavery was sanctioned by God, it shouldn't be practiced today. They had to go through plenty of theological pretzels to get to that conclusion, but it was still successful. Slavery was abolished and is no longer a part of America. But, keep this in mind. Slavery is also thundered against from the pulpit. It is now viewed as a sin. Holding human beings against their will and everything else that goes along with the practice. Slavery is spit at, condemned, verbally fought against, and products manufactured by virtual slaves are boycotted from every ministerial pulpit in America. Then, the condemnation of homosexuals is heavily preached, as well, in many circles of religion. Why? Why is slavery, sanctioned by God, re-sanctioned by Paul with rules for doing it right, and spoken of many many times more than homosexuality, a serious problem, while homosexuality - spoken of only a few times, the sentence for which was death, unable to get to heaven because of the practice - is condemned? Homosexuals are just as human as slaves were. We abolished the practice of human abuse called "slavery" due to our common understanding of the worth of mankind. In fact, we poked our finger in God's and Paul's eye to make the argument to do so. In the same way, we can now abolish the practice of the human abuse of rejecting, ostracizing, and condemning homosexuals. We have rejected God's words - correctly - about slavery. We can now - correctly - ignore what the Bible says about homosexuality.